The Flamingo is a resort and casino located right at the heart of the Las Vegas strip. Filled with fun activities and amenities, it’s one of the old-timers in the area. Those who knew Vegas before it was all glitz and lights knew that over 50 years ago, The Flamingo was the pioneer in the area thus its claim to the best spot in the entire strip. If you want to pack in as much fun as you can manage while in Vegas, stay in The Flamingo and you’ll be at the center of all the action. With the property being the longest along the strip, because it’s been such an institution, many of the awesome attractions Las Vegas have surrounded The Flamingo. There is little within Vegas that’s as iconic as Flamingo’s vibrant pink and orange facade. Even though its neighbors outclass The Flamingo in terms of luxury and amenities, its main feature has got to be comfort and excitement -- within reason. The hotel and casino offer a more relaxed vibe that transports you to an oasis of action. The main amenities include a full-service spa, health club, a selection of restaurants and bars as well as nearby attractions that include the Las Vegas Convention Center, Fashion Show Mall and much more. Within The Flamingo’s 15,000 square foot gaming space, there are over 1,300 gaming machines, 139 table and poker games and a hotel with over 3,000 rooms for you to rest from the day’s hectic festivities. One of the best features of The Flamingo is its range of slot machines. The Las Vegas gaming area has a wide variety of casino slot machines that include video poker, Megabucks and others that will give you a great casino adventure. 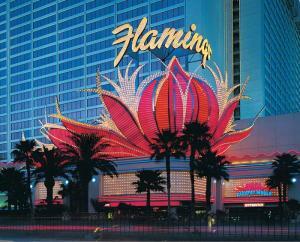 The Flamingo has everything you need but without the price tag that other more well known hotels along the strip carry. Considered a classic along the strip offerings, it doesn’t have the same shimmer as its competition but it still gives you all that you need if you’d like to try your luck at slot machines. If you’re looking to experience Las Vegas gaming and casino excitement without paying an arm and a leg, The Flamingo is probably one of your best bets. Enjoy The Flamingo’s laid-back, island vibe and enjoy the casino and gaming atmosphere with ease and comfort. However, if you’re in Vegas purely to gamble or play the slots, you may want to consider other options. From its rich landscapes, party scene and entertainment activities, The Flamingo is more of a full-fledged hotel and resort than a gaming casino. The Flamingo’s most notable activities within its walls include the Go Pool, Burlesque shows, celebrity-impersonation performances and restaurant selection.